MaryWebb is a Legacy Library. Legacy libraries are the personal libraries of famous readers, entered by LibraryThing members from the Legacy Libraries group. » Mary Webb's legacy profile. MaryWebb is also an author. » See Mary Gladys Meredith Webb's author page. 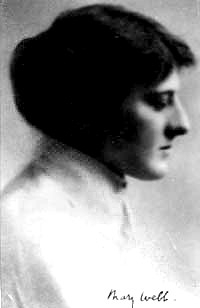 About meMary Gladys Meredith Webb (25 March 1881–8 October 1927), English novelist and poet, the author of Precious Bane and The Golden Arrow, among other works. About my libraryMary Webb's library is documented in a February 1938 sale catalog from the London antiquarian bookselling firm Elkin Matthews Ltd., which also contained books from the libraries of J.M. Barrie and Aldous Huxley ("Books from the Library of Sir James Barrie and Mr. Aldous Huxley, Together with the Personal Library of Mary Webb, consisting of only 30 Volumes"). Mary Webb's books form numbers 349 to 378 in the catalog. This melancholy little collection of thirty volumes formed the whole of Mary Webb's personal library with the exception of two reference books. They were all she had to satisfy an appetite which craved for beauty in literature as much as in life. She was seldom able to buy books, and it will be seen that most of these were presents. But they were not the presents of a host of admirers to a successful author to be acknowledged, shelved, and forgotten. They were presents from her very few intimate friends, and, as internal evidence proves, they were read and read and read again until some of them almost dropped to pieces. If you buy one you can be sure that you will possess one of Mary Webb's constant companions, to which she opened her heart in the little notes she wrote in the margins. You will know just the phrases which stirred and excited Gladys Meredith and, perhaps, inspired her to become Mary Webb. Mary Webb made good use of her books, and some of them are in poor condition, with worn covers. They have not been touched by us; we have preferred to leave them in exactly the condition in which they left her hands. Those for the preservation of which is advisable will be furnished with cloth cases without extra charge." The sale catalog notes that a bookplate "This Book Is From the Library of Mary Webb" was added to each volume. Note that catalog item 376 is omitted from this library; it is a pen-and-ink drawing by Mary Webb of a hyacinth, signed and dated 30 December 1923. On the back is a drawing of a girl's head. The booksellers add "It is not generally known that Mary Webb was an accomplished draughtswoman and needleworker." The drawing is priced at £5. There was a small piece on the sale of Mary Webb's library in the Melbourne, Australia newspaper The Age on 11 June 1938 (p. 5 of the literary section): "If Mary Webb, the novelist (writer of 'Precious Bane'), had taken her 'library' in a suit case to Charing Cross-road, London, during her lifetime, she would have been told to take it home again, unless the bookseller was in a charitable mood. Some are Everyman editions. But ten years after her death collectors are paying £5 to £35 per volume, writes the London 'News-Chronicle.' Thirty shabby, well-worn volumes, nearly all presents to her from friends, have been sold by her husband to a Mayfair dealer in rare books. They were her daily companions. Passages are underlined, and favorite poems marked with a check. Notes are scribbled in margins, and on some blank pages are drawings she made and original poems. A Browning in two volumes bought for her by her mother's companion, Mrs. Lyons (the Mrs. Marston of 'Precious Bane'), and containing a 12-line poem by Mary Webb, has already been sold for £30. The 'library' consists of 16 volumes of poetry, four novels, three books of legends and romances, two volumes of essays, four general books, and a manual on play writing. The manual is probably one of the few she had money enough to buy herself. It is a cheap edition, and so fully annotated that it is considered proof of her intention to write a play. This, too, is already sold, fetching £15."